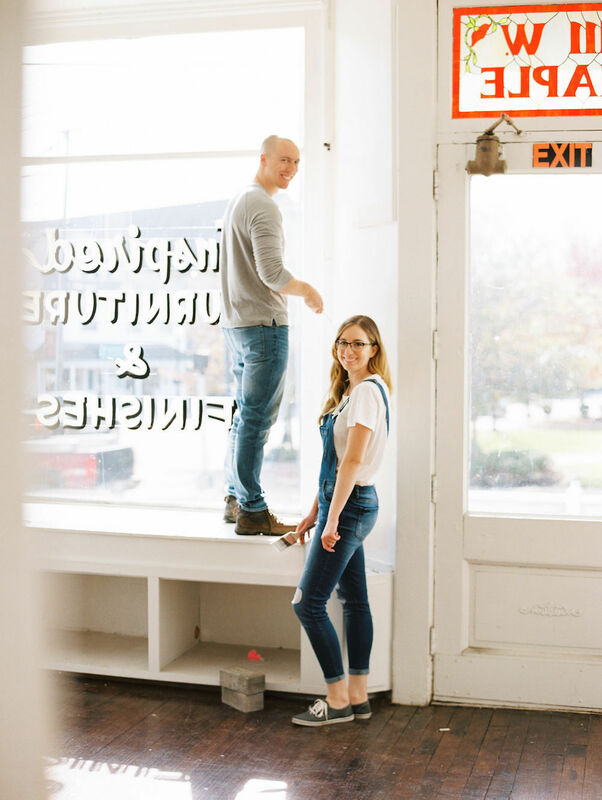 These pictures document husband and wife, Kylie and Ben, as they put the first coats of paint on what will be their new creative studio space. These images, shot on film, tell a story about the excitement of bringing a dream into life. They speak of the anticipation we feel in imagining the endless possibilities of what we could create. These pictures hold deep meaning, beyond just the transforming of a literal studio space. These pictures form parallels between the literal transformation of the studio space, and the idea that we transform ourselves and others, through deep and meaningful relationships in our lives. We pour the first canister of paint. You take to painting the trim, I work on the walls. But we focus, and back up to analyze our work. As if to anoint me. That have yet to be conceived. And here we are, pouring the holy paint that will make a miracle of this space. And a door that creaks open. We take to fixing the door, each of us wielding our tools. A screwdriver for you, a paintbrush for me. On opposite sides, we’re unified by the same challenge. We make life in this broken space. And you wrap me in your arms. Just you & me, in this space. Will always be in us. We set down our tools, as the sun sets. And our space is a little less broken than it was before.